There is certainly no lack of the Heavy Metal faith in LACK OF FAITH's monstrously riff heavy Metallic attack. Huge swathes of SABBATH-esque Doom pulsate from each track especially on offerings like "Nothing" whereas new influences from bands such as KILLSWITCH ENGAGE appear on "Suffocate" and "I". Vocally Ronny Hemlin trades between Dickinson, Halford and Dio, just check out his powerhouse wail on the brutally excellent "Suffocate" for early Dickinson. Although this is pure Metal don't expect this to be oh-so-very-friendly Swedish Power Metal. LACK OF FAITH are firmly up for battle in the well over crowded current Metal market and I see no reason for the band to stumble with this strong, well-produced album. Stand out tracks along with "Suffocate" include "Psychological Chaos" complete with another awesome riff and melodic vocals. 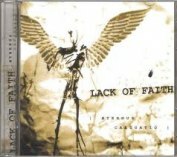 LACK OF FAITH combine a killer guitar sound that won't alienate the young Metal protagonist brought up on a diet of KORN etc and at the same time harkens back to the glory years of Heavy Metal. They back all this up with a more than capable lead singer who obviously relishes the prospect of making a name for himself. LACK OF FAITH may well be a contender for the next big thing and have all the raw ingredients to be the next big thing.